The Rebel Sweetheart. : Spotlight | Vice Cosmetics Water Gel Lip & Cheek Tint. 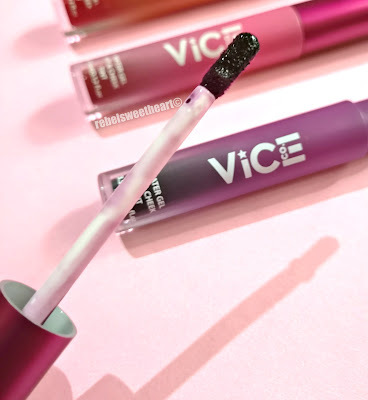 Spotlight | Vice Cosmetics Water Gel Lip & Cheek Tint. 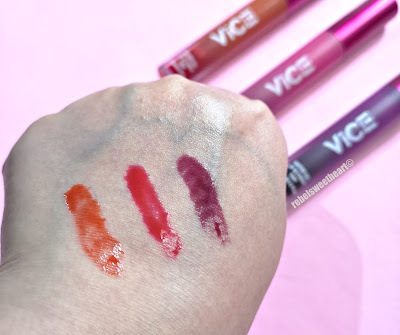 Although it was never my intent to buy or own any of the Vice Cosmetics lip tints, I somehow ended up with three of them - thanks to my friend who purchased the complete set of Vice's Water Gel Lip & Cheek Tints as soon as they became available online. When the tints finally arrived, she realized that some of the shades don't work for her while some of the colors looked almost identical. And with that, some of the goods came into my possession because you know what they say - sharing is caring. Lol! Vice Cosmetics Water Gel Lip & Cheek Tint. 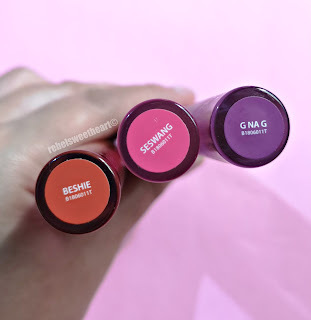 Following the huge success of the Phenomenal Liquid Lipstick and Good Vibes Matte Lipstick, these Water Gel Lip & Cheek Tints were launched last August and were geared towards a younger clientele. Each lip tint retails for just Php 145 a pop - a fair enough price if you're marketing the product to students and young adults and moms (and titas) on a budget. Shade names indicated on the bottom of the tubes. Vice Cosmetics describes this product as a 'water-based tint specially formulated for easy blending'. It promises 'intensely pigmented and long-lasting color with a lightweight texture for all day comfort.' 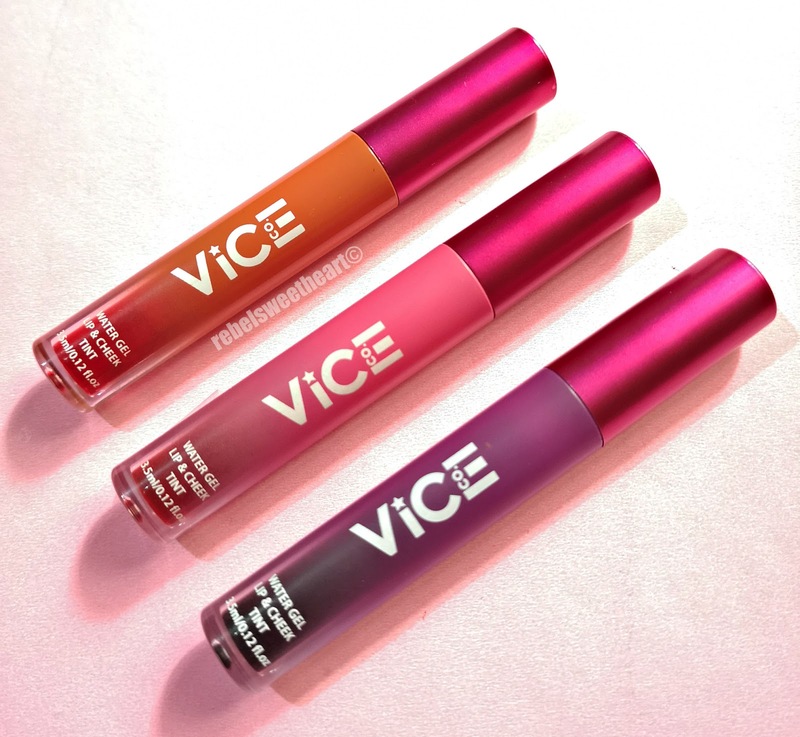 These lip tints are also infused with 'comfort-enhancing ingredients' and antioxidants such as vitamin E. Vice Cosmetics also guarantees that this line of lip products are paraben-free, cruelty-free, and contains no animal or animal-derived ingredients. The lip tints come in frosted plastic tubes with eye-catching, gradient colors. I have noticed, however, that the sponge tip applicators of these lip tints are flatter and wider compared to the applicators of the Phenomenal Liquid Lipsticks. These lip tints also have a sweet, fruity scent, which dissipates as soon as you apply the product on your lips. Swatches from L-R (indoor lighting): Beshie, Seswang, G na G.
In terms of formula and application, these water-based gel tints are easy to apply and easy to blend - if you're going to use them on your cheeks, that is. The tints are neither runny nor watery but they do have a notorious tendency of seeping through the lips and staining your teeth. They are nicely pigmented, and you can layer the colors to make it more opaque and intense. 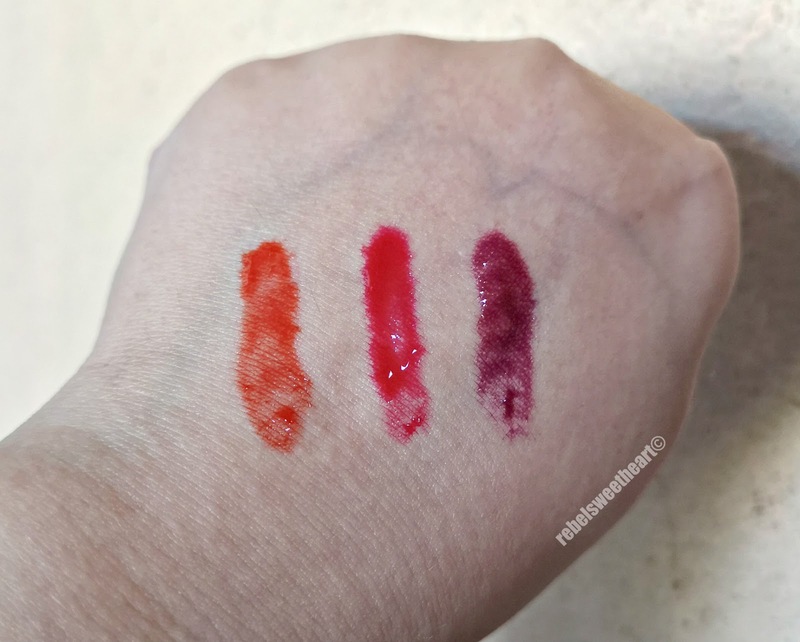 Swatches from L-R (natural light): Beshie, Seswang, G na G.
Seswang is a playful shade of fuchsia, and my favorite shade among the three. Beshie is a peachy orange shade that looks natural on the lips and gives your cheeks a nice, healthy glow. G na G on my lips. G na G is a deep purple shade that kinda reminds me of Kool Aid Grape. Staying power, for me, is so-so. The colors start to fade after about three hours, and you need to reapply after every meal, even after a cup of coffee. If it's any consolation, the darker shades stay put longer the lighter ones. However, the darker shades like G na G tend to settle on the fine lines on your lips, and they tend to become more prominent the longer you wear it. Overall, these tints are good enough considering the price. If you're new to gel tints or have a limited budget for it, consider these Water Gel Lip & Cheek Tints an option. However, if it's longevity you're after, this product may not be able to live up to your expectations. Holika Holika x Peko Hard Cover Glow Cushion. 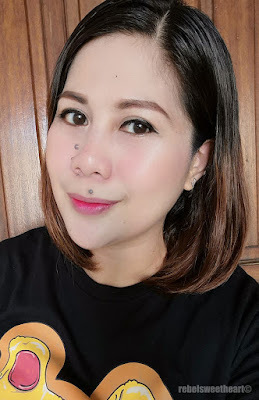 LIPS: Vice Cosmetics Water Gel Lip & Cheek Tint in Seswang. Yung Seswang lang din ang bet ko. I miss your reviews sis!!! I like Seswang too - not too bright, which is what I'd normally go for. I want to try that cheek tint! I haven't used blush since high school, so I'm curious how it looks! I love that the colors aren't super bold and have more a subtle look to them! Very pretty! Oh how fun! Love these bold colors. Good tips in here and descriptions! I think the Seswang lip color looks best on you! Very pretty. I’ve never heard of this brand, but your in-depth review has me interested. Seems like an affordable option for quality lipstick. They look lovely! Do they actually stay on your lips for a longer period of time? Love a multi product and the colours are so nice but that staying power issue is a big one. I eat a lot! This looks like an absolutely awesome set. I want to grab some! These look lovely! I have been searching for a long-lasting gloss that doesn't flake, so I'll have to check these out. I didn't know that water gel puppies are back to fashion. I love the subtle colours. Love all of the colors, my favorite is G na G, would love to add a few layers to make a bit darker for the fall. Great tip. Haven't tried this brand but now I will. These colors are gorgeous! Natural looking with just the perfect amount of color! I love all of these shades, and this is the amount of coverage I usually prefer in a lip color. Seswang is my favorite shade, too! The seswang is very pretty! I like that one the most! I've heard a lot of good feedback about this products and it looks really a good one because I saw from social media that most of the artists are using this products. I like cosmetics that are water-based & easy to blend...looks like they come in a nice range of shades too. what cute colors, I really really like them. How long do they last on your lips?? Those are pretty color. I honestly prefer matte lipstick though. Just because I feel it'll last longer. I'm very curious about this make up line. I've been hearing about how great the lipsticks are. Not a fan of Vice Ganda and I imagined her line to be a loud one but it looks pretty classy. I'm one of the "moms on a budget" who would love to try this! This will be on my list! My friend's daughter works for the marketing of Vice's beauty products, so I'm familiar with the tints. They're all so nice! Seswang is my favorite too. Haven't tried these yet and natry ko palang yung liquid lipsticks nila. Napupunta ba sa teeth yung tint? Sometimes kasi yun problem ko sa lip tints.